Maybe the review is from a legit (but clueless) customer. Or from a guy who fell asleep on his keyboard and held down CTRL+V with his nose. 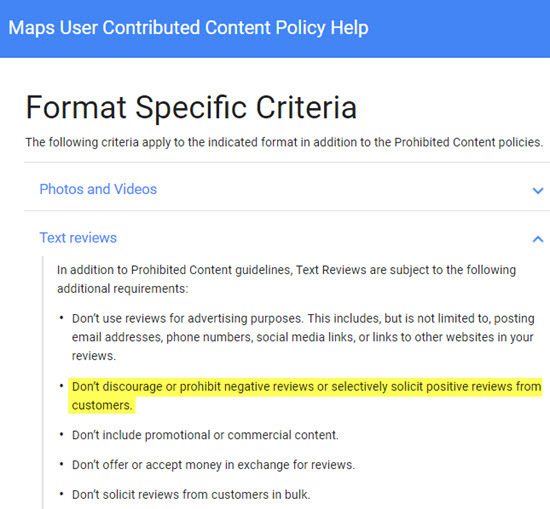 Still, in light of Google’s egregious mishandling of reviews, this is the sort of thing that makes you wish Google would just stop taking wild stabs at review-QC and just leave it to potential customers – humans – to make up their own minds. What’s a “blended review”? 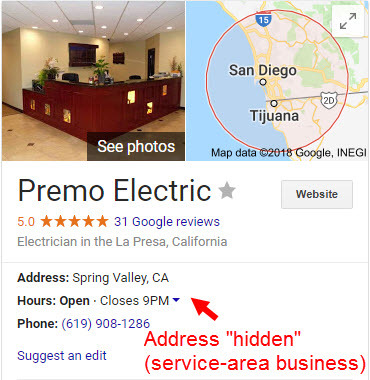 It’s where a customer writes a review of a business and uploads photos to that business’s Google Places page—which results in the review and pictures being “blended” in the review area. 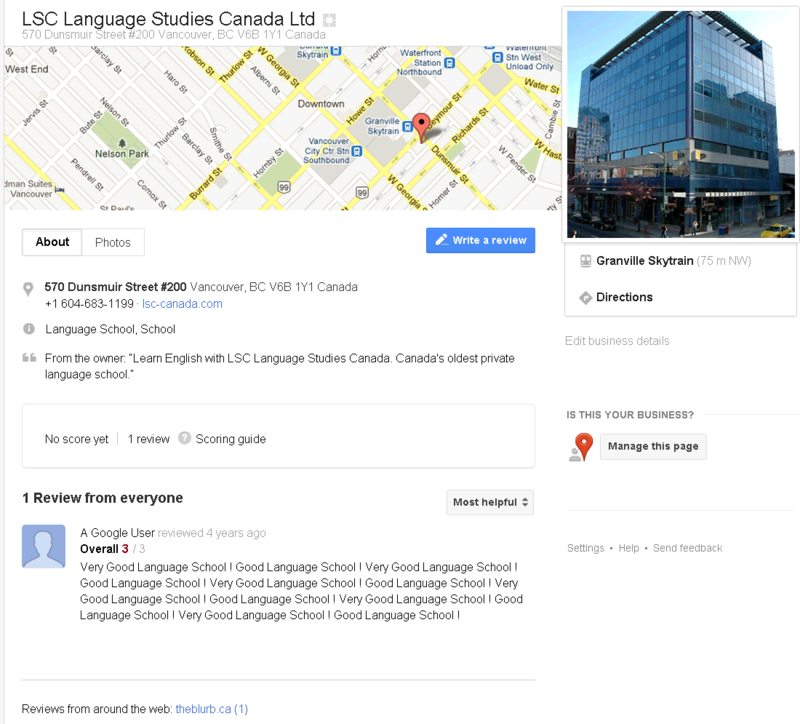 I want to learn more about these “blended reviews”—who has them, the kind of customers who leave them, how they’re ranked within the Google Places review area, etc. Trouble is, I just burned out my eyeballs by spending way too long looking for another example of one. I came up dry, and will probably need to go buy a pair of Coke-bottle glasses after this. That’s why I’m offering you a bounty. 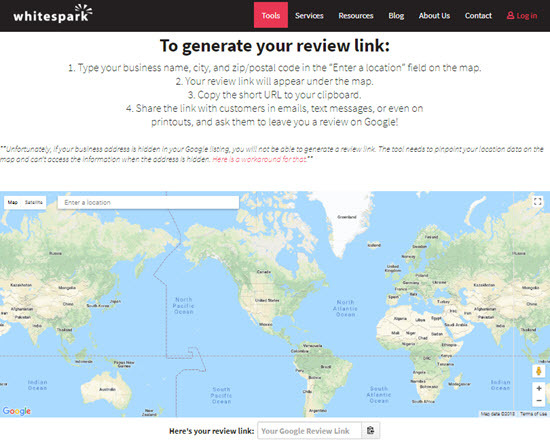 If YOU can send me a link to a business in Google Places that has at least one “blended review” (as described above), I’ll give you a free Google Places review handout or a “Best Ever” review handout. Two caveats: (1) you can’t simply send me a link to your Places page (where it’s easy enough to get a non-customer to upload a review and photos), and (2) you can’t send me a link to a business that you reviewed and uploaded photos of. In other words, it’s got to be a “blended review” that occurs in the wild—like of a business you’ve been to or stumbled across in Google Places. Bonus: if you can find me a naturally occurring blended review that is NOT for a hotel, tourist attraction, restaurant, or any place that sells food or drink, I’ll give you a free Google Places review handout AND a handout for getting “Best Ever” Google reviews. 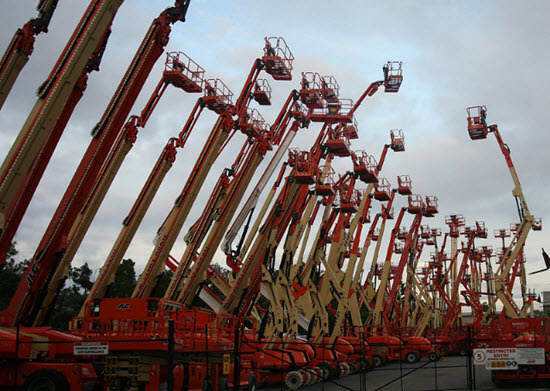 What I’d love to find is a business in a service industry (landscaping, roofing, plumbing, etc.) or a profession (doctor, lawyer, etc.) that has a blended review. Up to the task? In the words of Cosmo Kramer…giddy up! Special thanks to Linda Buquet and Nyagoslav Zhekov, who clued me in to the extreme scarcity of blended reviews. We’ve actually found a few more examples of blended reviews. Eric Marshall of ZCreative.com found this one. I also found a couple of others (by the same user who did the blended review for Mike’s Pastry) here and here. Notice that the blended reviews consistently rise to the top of the list of Google reviews. Sure, obviously Google considers them relevant reviews, because of all the bold keyphrases/sentiment fragments in the actual text of the reviews. And yes, Google does tend to put the more recent reviews at the top of the heap. 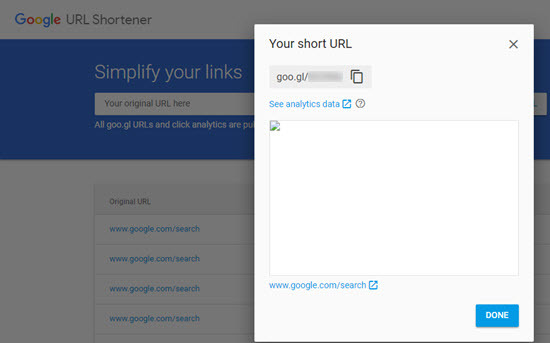 But based on even this little “core sample,” it’s pretty clear so far that Google gives blended reviews a spotlight. They’re inherently super-prominent just because they contain pictures—and Google is making blended reviews doubly prominent by featuring them at the top of the customer-review area. 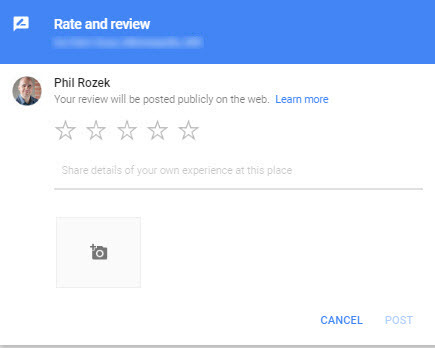 Reviews in Google Places have just gotten a little fancier: user-uploaded photos can now appear mixed in among customer reviews. 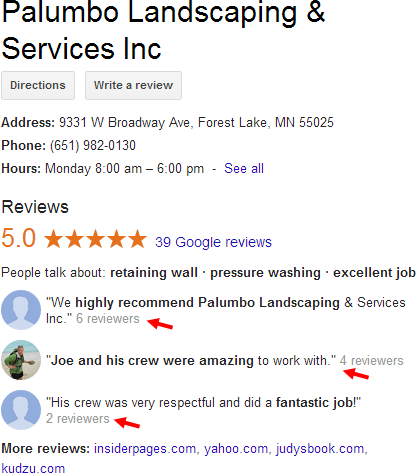 If a customer writes you a review and uploads photos to your Google Places page, the photos actually appear IN the review. 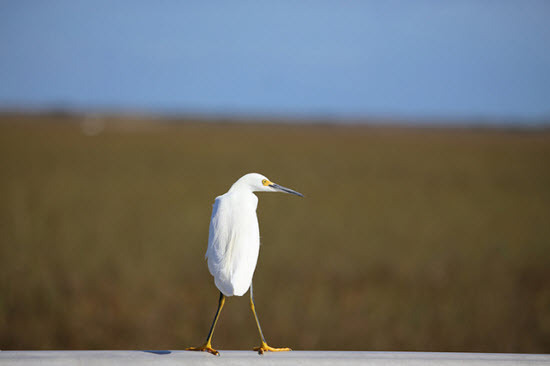 Customers have been able to upload photos for a while. 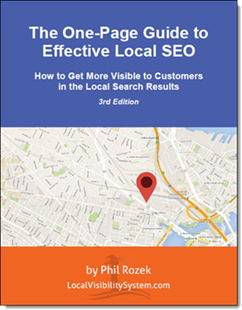 They’ve always been able to write reviews, but in the last few months Google has been placing more and more attention to your customer reviews—and making them more and more prominent on your Places page. Customer-uploaded photos and customer reviews have finally tied the knot. I predict that it’ll become more and more beneficial to ask your customers not only to write reviews but also to upload their pictures. It’s already a good idea.